B-mobile has a new SIM available that sounds like it could be very useful for frequent travelers to Japan. It is a post-paid SIM that has a ¥0 monthly base fee. 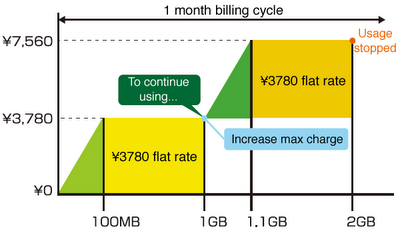 If you use no data in an entire billing cycle, then you pay ¥0. From 0 to 100 MB, charges are incurred at a per-byte rate (¥37.8/MB) to 100 MB. (Billing increment is a byte, not a megabyte.) From 100 MB, a flat rate of ¥3,780 is charged until 1 GB. At 1 GB, data is stopped. Or, you can change the maximum monthly charge to allow usage to continue. The SIM is cancelled after 6 consecutive months of zero usage. The SIM is purchased for ¥3,150. Registration of the SIM is done online and requires a credit card to be registered. No mobile phone based activation is required. Billing is post paid on anniversary date of activation (if activated on the 9th of the month, billing will be on the 9th of every money). Data speed will be very similar to the 1 GB Flat Rate SIM. Usage is preset to stop at 1 GB, but your can change settings to allow continued usage. Awesome, now bring that out including a postpaid voice service and I'm gonna need 2! 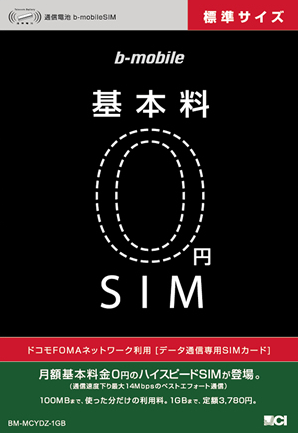 Not sure if it would be profitable for JCI to release a zero-yen voice SIM. A full-time resident of Japan would certainly be better off choosing the 1 GB Flat Rate SIM to get the same data service at a lower cost. It seems to me that this product is targeting to frequent visitors, who are much less likely to hold proper status of residency. Japanese law prevents non-residents from contracting cellular voice service. Of course there are people who are proper residents and are frequently coming and going. A zero-yen voice SIM would be perfect for these guys. But, are their numbers sufficient to justify the cost overhead? I doubt it.